The history and genealogy of the Goggin surname, its origins, meanings and ancestry. Information on the family history, heritage and ancestry of the Goggin surname and its genealogy. This website provides information on the derivation, ancestry and meaning of the Goggin surname and its history and origins. There are also pages with facts regarding Goggin ancestors and the Goggin name around the world. 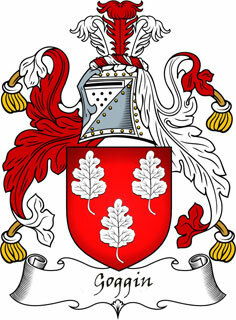 For the Welsh origin of the Goggin family name, the motto is Constans fidei, which means constant to honour. The March 2012 edition of the genealogy magazine, Who Do You Think You Are? has an article on Thames Watermen and features the lighterman apprenceship certificate and details of Charles James Goggin. Details of Charles' life and career with copies of all of his ligherman and waterman certificates are at Lightermen. Clothing and accessories emblazoned with the Goggin family emblem has now been made available through the Shop page. Births, deaths and marriages for Goggin surname are now searchable in the Genealogy section. A searchable database for appearance of the name Goggin on the English Census is in the Census section. The Goggin name is Celtic in origin and goes back to the parish of Cogan which is in the diocese of Llandaff, in Glamorganshire, Wales. Cogan is a place near Cardiff in Wales. This original Goggin family, like most of the South Welsh colonists, was probably of Flemish origin. It is said that the Goggin ancestors can be traced back to Cardigan where they were seated before the Battle of Hastings in 1066. The family was among the leaders of the invasion of Cork, Ireland; so most must descend from Richard de Cogan who lived in the early thirteenth century. Richard also possess lands around Bray in Wicklow and obtained lands in Galway at the time of the Connacht invasion, which the family lost during the fourteenth century. Also, in that century the greater share of the Cogan estate in Cork was overrun but they retained lands south of Cork until the seventeenth century. Evidence of settlement and occupation of Ireland can be shown to exist since 6,000 BC. Evidence shows the first settlers were Mesolithic hunters. About 795 AD the Norsemen began invading Irish villages and towns during these invasions they seized and fortified the ports of Dublin and Annagassan in 838AD. They Norsemen were expelled by Aed Finnliath King of Ireland between 862-879AD. The family name Goggin originally was used as a regional appellation. Regional surnames stem from place names including rivers, countries, and man made features such as buildings, crossroads and many other objects. A person could be given a name indicating a place which was readily recognised. In this case, the surname Goggin was used for a person from the township of Cogan in county Cork, Ireland. Records of the name Goggins indicate there were early bearers who became instrumental in influencing the development and direction of their country and held positions of power and authority during their lifetimes which enabled them to hold sway in the decision making process in events of national importance. Early records of the surname Goggin include Patrick Goggin from Goganrath in county Cork appears in the Hearth Money Rolls. Hearth Money Rolls were a tax of two shillings on every hearth or fire place in a dwelling. In the year 1663 a list was compiled of all households liable to pay this tax, together with the number of fireplaces in their dwellings and their obligations to the crown.